Rachel is a Lobby Compliance and Government Affairs Administrative Assistant and provides administrative support for the Lobbying Compliance Practice, along with all the practices within the Firm. She assists clients in completing reports required to be filed with Joint Commission on Public Ethics (JCOPE) and/or the appropriate authority – both bi-monthly reports and client semi-annual reports. She also helps clients with setting up internal procedures for tracking expenses, legislation, regulations, and procurement activity to report to JCOPE and/or the appropriate authority. She is able to assist clients with navigating the JCOPE filing requirements and website. Rachel also provides the team with research and administrative support for a variety of liquor licensing and government affairs projects. 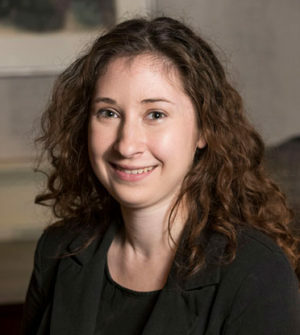 Prior to working at Shenker Russo & Clark, Rachel worked as a bookseller at Barnes & Noble and interned at two literary agencies in New York City. Rachel graduated from Hamilton College where she majored in English and Classical Studies. She also studied abroad in Rome, Italy for a semester and was selected as a member of the Phi Beta Kappa honor society. When not at work Rachel enjoys spending time with friends and family and settling down with a good book.